Dr. Suzi Jacklin is a professional diabetologist, with over 8 years of experience in the field and currently practices at the Lifespan Diabetes Clinic - Bangalore. Dr. Suzi Jacklin has completed her MBBS from the prestigious DR. B R Ambedkar Medical College she went on to get her CCEBDM from the PHFI. Diabetes is a hard subject and Dr. Suzi Jacklin ensures that she treats her patient with proper approach and specific treatment plans. Her other specialties include Prevention & Treatment of Diabetes, Diabetes Management, Type 2 Diabetes Treatment, Diabetic Diet Counselling and Adult Diabetes Treatment. Dr. Suzy Jackline also ensures that she is able to make up individualized treatment plans for every patient of hers as diabetes may not be same for everyone. She is a highly respected individual for her works and has been consistently getting high ratings among her patients. She is also a well-known and a respected diabetologist in Bangalore. 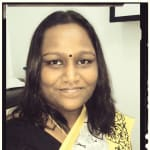 She is well versed in English, Hindi, Kannada and Tamil and her consulting fees are INR 600 at the clinic in Bangalore. If you are in the Bangalore region, her appointment can be booked online too. I was having very bad thoughts regarding my diabetes. The Lifespan diabetes clinic is decorated very nicely and doesn't look like a hospital. From quite some time i was noticing symptoms, but never gave much importance to it. The diabetes treatment has helped me greatly and now I am perfectly fine. The overall atmosphere in the Lifespan diabetes clinic is very soothing. One of my cousin's referred to DR. Suzi Jacklin. She is so pleasant to talk to and always ready to answer your doubts. Suzi Jacklin has so much knowledge that for everything my family takes herreference. It's been more than a year now, and I have noticed considerable change in myself. The complete process of diabetes treatment is so painless and quick, and i am so relieved that I chose to consult her. I was in too much pain because of diabetes, but even after consulting a number of doctors, I was not getting any relief. The overall atmosphere in the Lifespan diabetes clinic is very soothing. She is not just friendly, but also is very motivating. In order to diagnose my problem completely she asked me a number of questions. I was shocked to know that I am suffering from sugar. I am so thankful to Dr Suzi for giving me the best advice and I am now finally able to get back to my normal self. I have consulted so many doctors but nobody till now was able to understand my concern properly, until i consulted her. She ensures that she listens to her patients and then start the treatment. Her guidance and treatment helped me immensly to deal with an issue. I consulted number of specialists but the way she treated me was the best. Overnite my body weakness aggravated. All the staff members were very helpful. Dr Suzi Jacklin has a very positive attitude towards all the patients. Many people gave very positive feedback for the Suzi Jacklin. her advice and counselling has helped me immensely. Someone from the office, referred us Dr Suzi as i was suffering from diabetes type 1. Not only she is very calm and composed, but is also a very understanding doctor. She has expert knowledge in the field. I owe her a big thanks for making me fine again. The overall atmosphere in the Lifespan diabetes clinic is very soothing. I was suffering from diabetes due to which I was also facing sleepiness. I consulted Dr Suzi, she healped me greatly. I owe her a big thank for treating me so well. She asked me number of questions in order to know the main cause and then started the treatment. I was suffering from vitamin deficiency due to diabetese. I consulted Dr Suzi who is a well known diabetologist in Karnataka. Her treatment was very effective. I am glad that I chose to consult her. I found the answers provided by the Dr. Suzi Jacklin to be well-reasoned and helped me improve my health. This doctor has given the reasons for his principled answer as such it is educative as well. dr Suzi Jacklin is a very nice and talented doctor at Lifespan diabetes clinic in Banglore. I took a treatment from her for the problem of acne scars on my body. She cured it in no time. 5 Gastrointestinal Complications of Diabetes! Diabetic diarrhoea: Patients who have been suffering from diabetes for a few years may experience an increased urge to pass stools frequently. This is usually related to gastric problems in the colon which cause fluids to move at a faster than normal speed through the small bowel and colon. It may also be caused due to the secretion of fluids in the colon and improper absorption of food. Chronic Diabetes - Things You Must Understand! Diabetes is a known and common medical condition in which glucose or sugar levels gradually build up in a person's bloodstream. In such conditions, enough insulin is not present for moving sugar inside your cells. When such a situation arises, sugar is utilized for obtaining energy. Due to this, your body will tend to rely on alternative sources of energy in the muscles, tissues, and organs. This process continues resulting in a chronic disorder. Warning signs of type 2 diabetes usually develop very slowly. You might have it for years without even knowing about it. Due to excessive sugar building within your bloodstream, fluid tends to come out from tissues. In turn, your thirst might increase and lead to frequent and excess urination because of additional water consumption. If you have chronic diabetes and is unaware of it, then gradually fluid might be pulled out from eyes' lenses and lead to blurred vision along with an inability to focus properly. Some patients with type 2 diabetes also get affected by frequent kidney, skin, bladder infections. Due to high blood sugar level, such infections might take a long time to heal completely. If you possess dark patches and velvety skin especially in the folds of neck and armpits or any other body parts, then it will be a wise decision to consult your physician immediately as it is another warning sign of chronic diabetes. Besides increasing thirst, another basic and contradictory symptom of type 2 diabetes is increased hunger along with weight loss. Despite consuming more food than usual to cope up with the increased hunger, an individual having high blood sugar may lose weight. You might also feel irritated or tired if the cells of your body are deprived of sugar. Various other symptoms including foot pain, yeast infections, itchy skin, numb feeling, etc. are also present and the signs become severe and more dangerous with the progress of the disease. What is the perfect time to visit a doctor? If you notice any of the above mentioned symptoms of chronic diabetes, then that is the best or perfect time to see a physician. It is not mandatory that you will definitely have this health disorder if you observe any symptom within yourself. If you have excessive work pressure for a couple of days, then for sure you will feel exhausted. But, that does not mean your fatigue is the warning sign of diabetes. For being, sure enough, it is best to consult a trained medical practitioner. Without proper treatment, diabetes can also become threatening to life. This chronic health disorder might result in complications related to heart, and during pregnancy, it can prove deadly.Maintaining a healthy eating habit, controlling weight, performing a daily physical exercise and consuming recommended medications will help in controlling high blood sugar level. Diabetes is a condition where the blood sugar level rises in your body either due to less insulin level in the body or reduced sensitivity of the body to insulin. The foods you eat have a major role in controlling your blood sugar levels. You need to pick your foods wisely to prevent your blood sugar levels from spiking. 1. Dark chocolate: Chocolate contains good amounts of flavonoids that help in improving insulin sensitivity and limits food cravings. It also reduces your chances of heart attack. 2. Blueberries: Blueberries are rich in fiber that helps you in managing your blood sugar levels. They also contain anthocyanins that assist in regulating your blood sugar levels. 3. Fish: Fish is rich in Omega 3 fatty acids that reduce inflammation in the body, thus reducing your chances of heart problems. Fish is also a good source of protein that helps you in feeling fuller. 4. Olive oil: Olive oil is rich in antioxidants that help in reducing your chances of heart diseases and diabetes. 5. Oranges: Make sure you eat plenty of oranges as they are rich in vitamin C and they reduce the risk of diabetes. You may also opt for broccoli or strawberries. 1. White rice: White rice is a refined grain which, when consumed, tends to spike your blood sugar levels. You can instead opt for brown rice. 2. Bananas: Banana may contain vitamins and minerals, but are also rich in carbohydrates. Instead, opt for fruits like berries that are not only rich in fiber and antioxidants, but also have a low glycemic index. 3. Sugary foods: The term sugary foods is used to describe foods such as pastries, cakes and cookies. These foods are carbohydrate rich and do not contribute much in making the body healthy. Instead, replace them with natural foods such as chickpeas and peanuts. 4. Dried fruit: Various dried fruits contain high concentration of sugar, which happens due to the dehydration process by which they are formed. So replace them with fresh fruits such as guava and peaches to control your blood sugar levels. Amongst all other dry-fruits, Almonds and Walnuts can be had in moderation as they contain essential fatty acids and do not effect blood sugars. Stick With Fitness: Tips for Staying Fit With Type-2 Diabetes! Type 2 diabetes is commonly seen in adults, but nowadays its prevalence is rapidly increasing in young adults and even teenagers. It is a chronic disorder that adversely affects the way your body processes and metabolizes the glucose (blood sugar). In Type 2 Diabetes, your body either resist the effects of insulin, a hormone that controls the sugar flow into the cells or does not produce adequate insulin to maintain a normal glucose level. Incorporating a healthy living, with the focus being on eating healthy and exercising regularly (for about 30-45 minutes) can help keep Diabetes Type 2 in check. Take small and frequent meals i.e. 4-6 times a day spread across regular time intervals. Also, carry a quick fix of carbs that can come to aid when the sugar levels drop. Foods rich in fiber and complex carbohydrates, such as bread, vegetables, fruits and whole grain cereals should be at the top of the priority food list. Stay away from fatty or fried food. Keep a check on your glucose level regularly at home with the help of a blood glucose meter. A three monthly HBA1C test (three-month average blood sugar) can help to know overall blood sugar control. Limit consumption of alcohol and completely cut down on tobacco. Get up from your couch and hit the nearest jog course or do the exercise of your choice. There is no substitute to physical activities if you are on your way to control Diabetes; be if any type. Assess cholesterol and blood pressure count periodically. Because of nerve damage and poor blood circulation, your foot may have to bear the brunt of this disorder as well. Take good care of your feet. Check your feet for swelling, red spots and blisters; wear special shoes with a soft pair of socks that can keep your feet dry. Get your feet examine by special instruments for blood circulation and sensation in feet. Diabetes damages oral health as well. Visit a dentist for a gum and tooth checkup at least a couple of times in a year. Get your kidneys and retina tested as diabetes may weaken the blood vessels of these areas. Diabetes - Can It Affect Your Kidneys? Each tiny action we commit involves the risk of a condition, disease or disorder. For instance, sneezing a bit too hard can rupture an eye vessel, or having your face right up against the wind in a moving bus can expose you to germs. Diabetes is as prevalent as common cold in every household and there is no end to the list of causes that can make you suffer from it. While regular check-ups, medications, insulin shots can help you cope, there are certain measures that if followed, can enable you to avoid the risk of secondary yet fatal diseases. Diabetic nephropathy is one such condition. When Kidney is affected to the extent that it cannot perform its functions(like excretion of wastes in urine, filtering blood from waste, maintaining electrolyte balance,etc.) properly, it is called as Nephropathy. The reason behind kidney damage could be many, but if diabetes is the prime cause, it is known as diabetic nephropathy in medical terms. The kidneys comprise of several small blood vessels, which perform the function of sifting waste from your blood. Diabetes at an advanced stage can impede smooth functioning of these vessels. As a result, the kidneys malfunction or a person faces kidney failure. Nephropathy brings along some other health issues as well. A person's blood pressure may increase as a result, thus making him or her prone to heart attacks and strokes. Sharp rise in cholesterol and triglyceride levels has also been noticed. A doctor will check for the presence of a protein called albumin in the patient's urine to know if you suffer from nephropathy or not. Other tests to determine the functioning of kidneys are - S.Creatinine, eGFR, Albumin/Creatinine Ratio (ACR), 24 Hour Urine Protein, Renal Function Tests, etc. A diabetic person should therefore go in for yearly tests. In a given situation such as this, dialysis or kidney transplant comes to your aid. Both are done when kidney functions are irreversibly damaged. Dialysis can be of two kinds; Hemodialysis or Peritoneal dialysis. Dialysis (also called as Renal Replacement Therapy) remedies kidney damage and kidney failure by using a machine to extract salts, wastes and other fluids in excess from the blood to let your blood have a healthy composition. Dialysis should only be done under the supervision of an experienced nephrologist for best results. If you wish to discuss about any specific problem, you can ask a free question. I am 60 year's old. I am Suffering from diabetes. What diet should I prefer and What Shou be dos and do not! I want To be cured as soon as possible! What medicine Do you prefer? Diabetes cannot be cured but it's complications can be prevented by following healthy lifestyle. Avoid sugar, white rice and maida. Eat fruits in between meals and not after 7pm . Prefer small meals but in a frequent pattern. Brisk walking for atleast 30min a day for 5 days a week. medicine can be prescribed after consultation. Cardiovascular Disease & Diabetes - Know Everything About It!! Since blood is part of the cardiovascular system, and diabetes is a condition in which the level of glucose in the blood is higher than normal, then is certainly some relationship between the two. Diabetes and cardiovascular system diseases has been recognized to be closely related to each other due to the so-called insulin resistance syndrome or metabolic syndrome. Some examples of the commonly diagnosed cardiovascular disease are coronary heart disease, stroke, high blood pressure and other heart conditions. Diabetes is considered a major risk factor in cardiovascular diseases. Other factors that contribute to the possibility of acquiring cardiovascular diseases in diabetic patients include hypertension, smoking, and dyslipidemia. How Diabetes Causes Cardiovascular Problems? Hypertension: Hypertension in diabetes is considered a major contributor to the increase in mortality from cardiovascular diseases. Diabetic patients, especially those with Type 2, need to always have their blood pressure checked every visit to the doctor. Self-monitoring at home is also a must to maintain and control the rise of blood pressure. The American Diabetes Association recommends a target blood pressure of not more than 130/85 mm Hg to maintain a good level of blood pressure. Arteriosclerosis and Atherosclerosis: Arteriosclerosis is the stiffening or hardening of the artery walls while Atherosclerosis is the narrowing of the artery because of plaque build-up. Atherosclerosis is a form of hardening of the blood vessels/arteries, caused by fatty deposits and local tissue reaction in the walls of the arteries. Diabetes is a documented high risk factor for the development of both Atherosclerosis &amp;amp; Arteriosclerosis . Heart disease and stroke, arising mainly from the effects of atherosclerosis, account for 65 percent of deaths among diabetics. Hyperglycemia: Hyperglycemia means high (hyper) glucose (gly) in the blood (emia). Your body needs glucose to properly function. Your cells rely on glucose for energy. Hyperglycemia is a defining characteristic of diabetes, when the blood glucose level is too high because the body isn't properly using or doesn't make the hormone insulin. There is a growing recognition that diabetes belongs to a special category of risk factors because it markedly increases risk of CVD. This increase is partly the result of the pernicious effects of persistent hyperglycemia on the vasculature and partly due to the coexistence of other metabolic risk factors. Smoking: Smoking has been determined dangerous to our health. Studies show that smoking indeed increase risk of premature death and cardiovascular disease in diabetic patients. Atrial Fibrillation: Atrial Fibrillation means an irregular and rapid heart rate which can increase the risk of stroke, heart failure and other cardiac issues. Individuals with diabetes are at an increased risk of developing atrial fibrillation. This risk is higher among patients with a longer duration of treated diabetes and poorer glycemic control. Individuals with insulin resistance or diabetes in combination with one or more of these risk factors are at even greater risk of heart disease or stroke. However, by managing their risk factors, patients with diabetes may avoid or delay the development of heart and blood vessel disease. Your health care provider will do periodic testing to assess whether you have developed any of these risk factors associated with cardiovascular disease. If you wish to discuss about any specific problem, you can ask a free question. Is it useful to use biryani leaf for reducing blood sugar. If its true how can we find original leaf. Or any ayurvedic company selling powder. Hi Biryani leaves or bay leaf is known to improve insulin function as per some studies. You can get it in the form of Herbal capsules through AMAZON. But while regularly consuming this supplement you have to check your blood sugars frequently to make sure there is no repeated low blood sugar levels. In such situations you may need dose adjustment of your diabetic medications. I am 60 diabetes can I have honey daily as some people say honey don't have any sugar it it true? Hi Honey is a natural form of sugar. It increases blood sugar. Take it occasionally only if your blood sugars are well controlled.